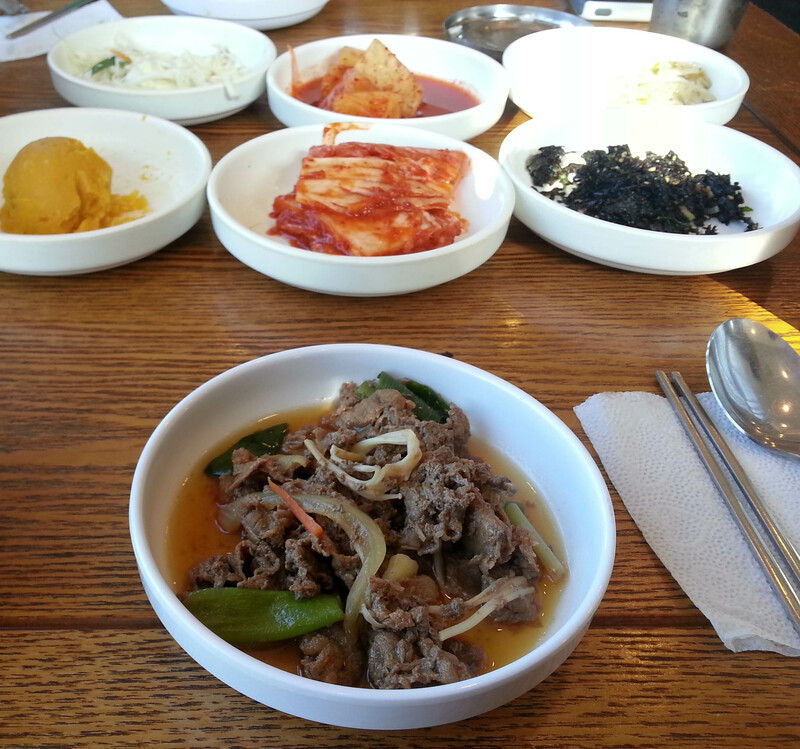 Bulgogi is a popular Korean dish usually consisting of marinated beef that is thinly sliced and cooked over a grill. 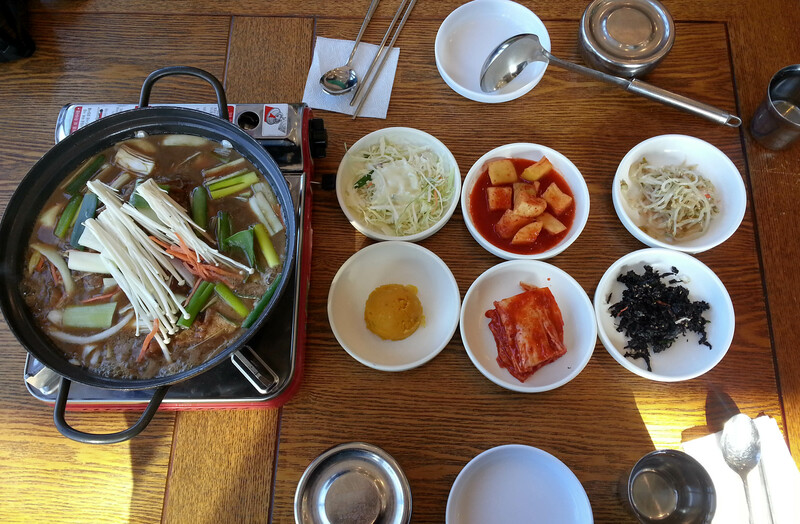 It translates to fire (bul) meat (gogi), referring the grilling of the meat over an open flame, however it is common to see this dish being pan-cooked as well. There are different variations of the marinade, but they are all usually slightly sweet, making it especially appealing to those that don’t like spicy food. Soy sauce, sesame oil, garlic, onions, pepper, ginger, and sugar are common ingredients for the marinade, and you’ll sometimes find fruits such as crushed pear added for sweetness (my favorite!). 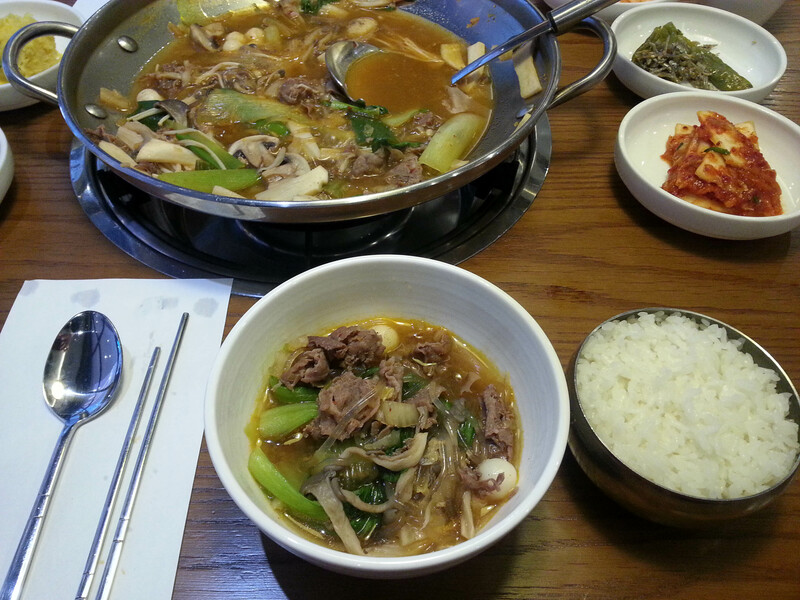 When bulgogi is pan-cooked, vegetables like mushrooms, carrots, green onions and bok choy are often added, resulting in more of a soupy dish rather than just the grilled meat. I still haven’t decided which way I prefer bulgogi to be prepared, but I have come to the conclusion that I like to eat pan-cooked bulgogi with rice and grilled bulgogi with lettuce or perilla leaves for wrapping. I can’t wait to get in the kitchen and try my own version! Pan-cooked bulgogi with onions, peppers, mushrooms and carrots. Bulgogi that is being pan-cooked at our table with traditional side dishes of cabbage salad, cubed radish kimchi, bean sprouts, mashed sweet potato, kimchi and dried seaweed. It was all delicious! This is bulgogi jungol (a stew of sorts) that has extra broth, glass noodles and rice cakes in addition to the beef, mushrooms, onions and bok choy. At this particular restaurant they used fruit juices to sweeten the marinade instead of sugar, making it one of my favorite bulogi dishes so far.